Welcome to the nuclear wastelands of the 21st Century where a society ravaged by lawlessness makes its last stand against the hordes of mutated goons known as the D.O.A. The D.O.A., self-named in honor of the fate met by most who cross their path, are led by a mind-crazed kingpin whose real identity remains unknown. An army of D.O.A. punks stand ready to crush, without mercy, any attempt to eradicate their leaders... no price too high to pay. 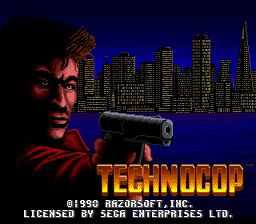 To my knowledge, I am one of few surviving members of the Enforcers, a once elite crime fighting legion... they call me TECHNOCOP. I operate alone, packing state-of-the-art firepower: the .95 AutoMag, designed for internal explosion of human targets. A Tonari snare gun and criminal target locator round out my hand held arsenal. My VMAX Twin Turbo Interceptor is capable of cruising at 200 MPH plus. Equipped with Apache side-mounted cannons and Pulse long range nuclear torpedoes, the VMAX transports me down treacherous highways to D.O.A. infested tenement buildings to hunt my prey. On-board crime computers provide me with vital updates on crimes in progress... still, nothing can replace that unmistakable gut feeling I get. I must remain razor sharp. Flying axes, rabid rats, whips, bombs, and brute force lurk around every corner. Any sign of weakness and the blood on my boots could be my own. I have witnessed countless atrocities committed without conscience by these renegade killers. My orders are to avenge these violations of society. I log this entry with the hope that it won't be my last. --From the Genesis TechnoCop instruction manual.